Building a script occurs in 4 easy steps. Customize your script following the steps below. Our YesTrak Agents follow your lead and take whatever action you decide: “Take a Message”, “Book An Appointment” or “Gather Information”. List of Phone Script(s): Either click the ADD button to add a new script, EDIT to update existing script or the RED Circle X to delete a scripts. A. Select the business: Since you can create multiple businesses in the YesTrak Application, select business this script is associated with from the drop-down menu. B. Classify Callers: Enter how you would classify these callers. For example: New Clients, Existing Clients. 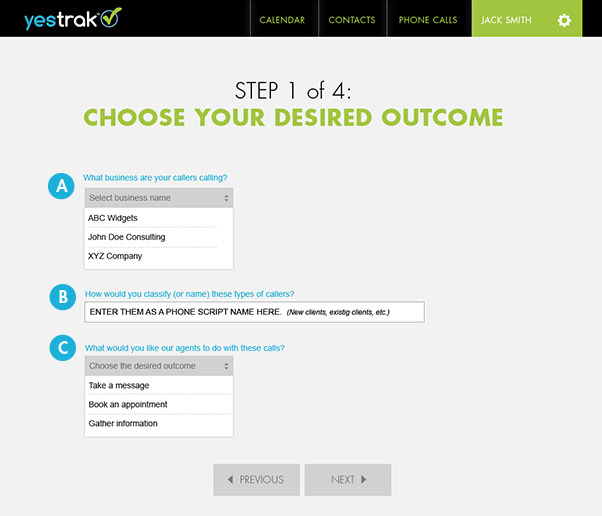 C. Select the outcome: Tell us what action a YesTrak Agent should take with these calls. For example: Take a Message, Book an Appointment or Gather Information. Click NEXT when your done. The telephone number used when creating a script is for infrastructure. 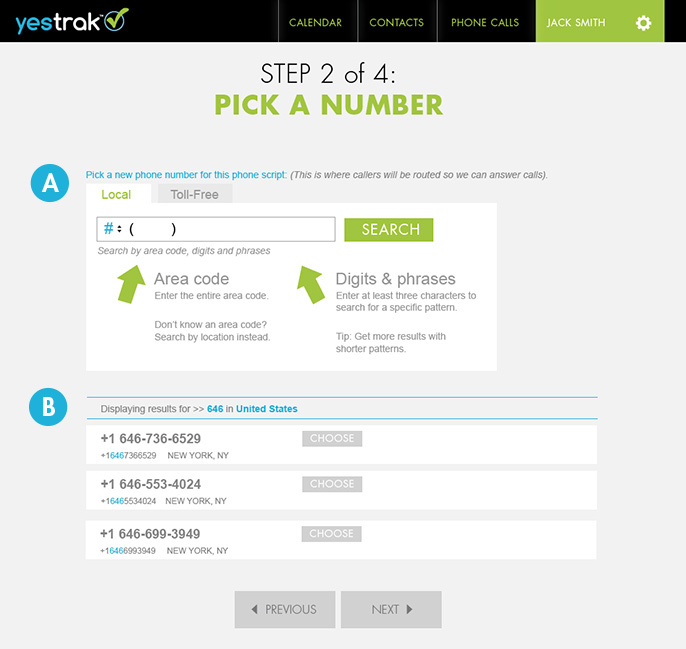 It’s how we deliver calls to the YesTrak Agent and differentiate between different menu options. You are not charged for the telephone script numbers. A. Choose a Number: Choose a number associated with your script by area code or toll-free. B. Make a Selection: Select a number available for use based on your settings in click the CHOOSE button. Based on the script action determined in Step 1, the appropriate Script appears with customizable form fields. This is where you tell our agents what to say to your callers. Our “Book an Appointment” Script is shown below, click on the image to view the "Gather Information" and "Take a Message" Script. A. Fill in the Script: Follow the directive for each field. Enter information our Agents share with your callers. Everything from Business name, Appointment Type, Calendar Selection, etc. is filled out here. Just a few more details and our script will be ready to use. A. Business hours for the Script: Tell us the business hours for the phone script: Normal or Split. A. 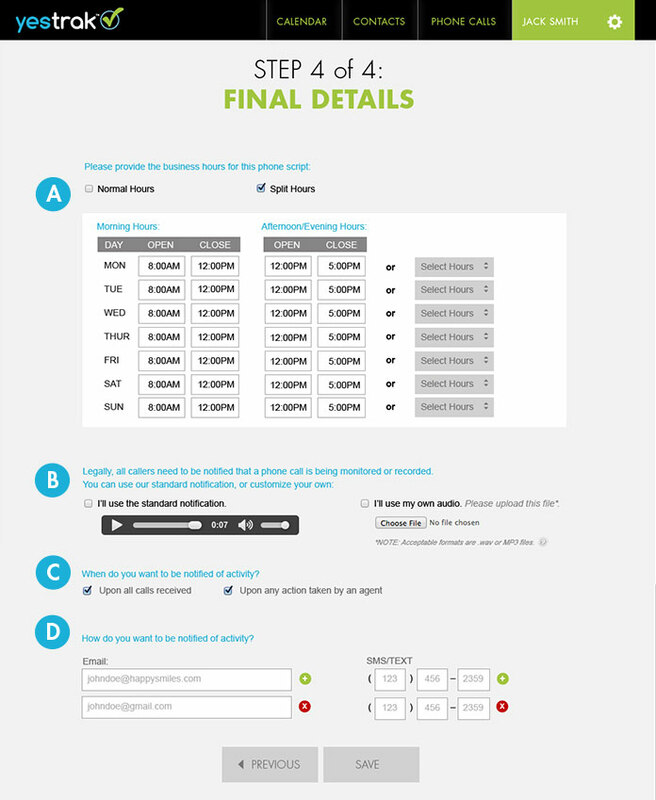 Normal vs Split Hours: Tell us the business hours for the phone script: Normal or Split. 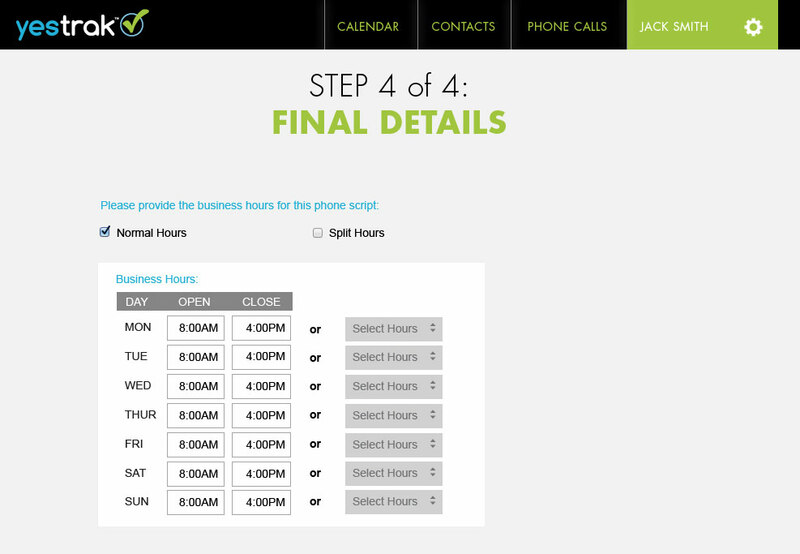 Split hours are perfect when you only need YesTrak Agents to cover the phones before or after hours on on lunch. B. Upload Audio Recording: Legally all callers need to be notified that a phone call is being monitored or recorded. Use our standard audio notification or record your own file and upload it for use with this Script. C. Frequency of Notifications: Tell us when you want to be notified of activity with the Script. 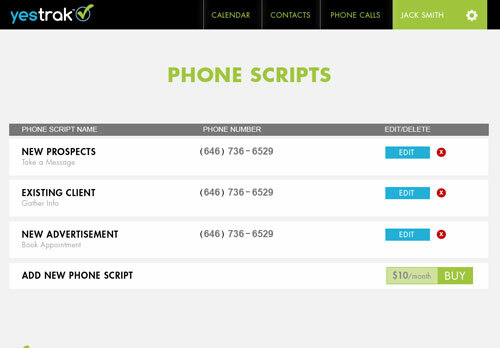 Examples of notifications include: “Script has been updated”, “Appointment has been booked”, “Call Received”, etc. D. Notification Method: Select how would you like to receive notifications. Notifications can be sent via e-mail or SMS/TEXT. Click SAVE button when your done.